As the silver sun set over the sleepy village of Nakatsugawa Gifu Japan, a small family of woodworkers bent their weary backs to repair and produce fine hand-made instruments. The year was 1959 and the small instrument shop located at the foot of Mount Takamine was collectively bent upon the production of guitars that would eventually come to be known as "Takamine." In 1968 a gentleman by the name of Mass Hirade who was known for his expertise as an artisan and luthier as well, joined forces with the small company with the intent of helping to improve the quality and marketability of Takamine guitars, and hopefully increase sales and distribution as well. Hirade took over design and development of Takamine's well-known classical guitar which to this day has been the most popular of all of their wares worldwide. With Hirade's help, Takamine was able to expand their sales overseas and become a more active enterprise on a global level. During the mid 1970's, Hirade became the president of Takamine and made a move to join forces with an American-based company by the name of Kaman Music Corporation. Takamine subsequently began a new phase of world-wide production and distribution that brought the company notoriety throughout the world. During this same period of time, a problem that had been vexing professional acoustic musicians came to a head and compelled the Takamine Corporation to step up and produce what is known as the "palathetic" pick-up. Because an abundant number of successful musicians were playing larger and larger venues, many of these same players struggled to attain accurate and acceptable sounding amplification and sound reproduction from their acoustic guitars. The "palathetic" pickup is designed to be isolated from the vibration of the body of the guitar which allows for less feedback and a clearer representation of the string's resonance. 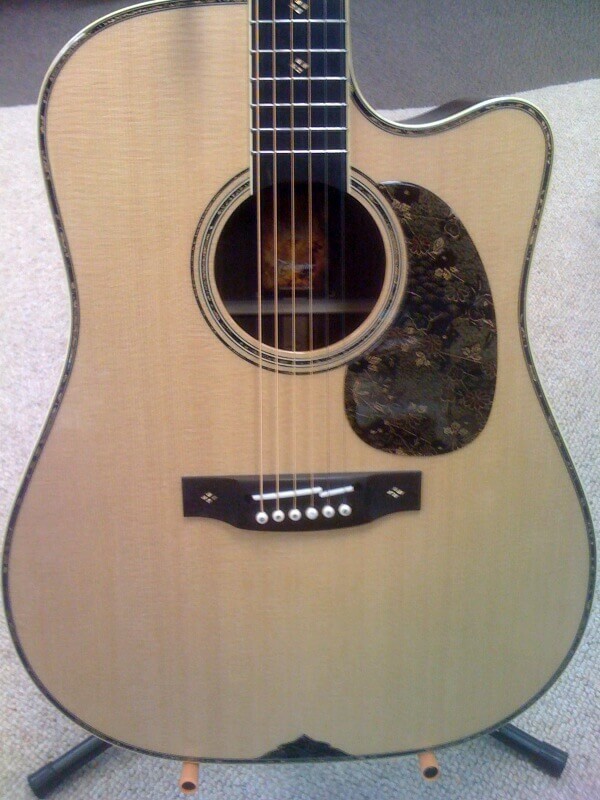 Takamine's design has become the industry standard for acoustic-electric guitars to this day and is endorsed by such big-time players as Bruce Springsteen and Jackson Browne. The Takamine LTD is a magnificent piece of musical craftsmanship that boasts a solid Sitka top with the Kimono cloth design inset into the rosette, bridge, binding and fingerboard inlay. The design is absolutely beautiful and adds an unusual and unique element to the guitar heretofore unseen in other acoustics. 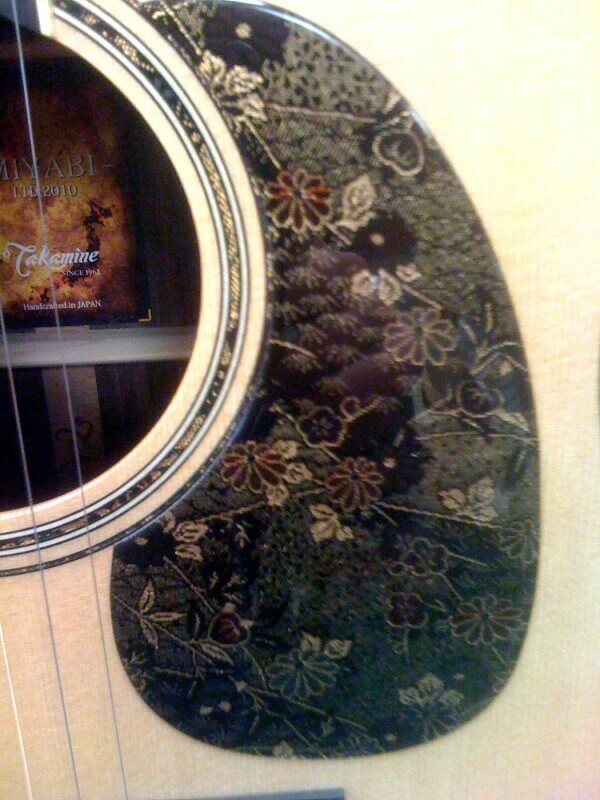 The back and sides of the guitar are comprised of Rosewood while Mahogany is used for the neck composition. This impressive guitar also features an ebony fretboard and a split saddle for more reliable tuning. The guitar is 25-3/8" scale length and 1 and 3/4" at the nut. But more importantly is the electronic system included with the Takamine LTD. The highly anticipated and long-awaited cool tube pick-up is the first on-board tube preamp made available in an acoustic guitar. The tube runs on a mere three volts and maintains a temperature of around 2 degrees F above the ambient air temperature of the inside of the guitar. According to professional musicians who have utilized the cool tube system, the tube tends to add warmth and thickness to the sound and works well in combination with the included Piazzo pick-up as well. On board controls include bass and treble controls, semi-parametric mid-range, as well as an accessible blending control which allows the player to fine tune their sound between the values produced by the cool tube and the Piazzo. This system is a giant leap forward in terms of sound reproduction and amplification, and should be experienced first hand to truly grasp its grandeur. Hold on to your hat but this guitar is actually available for around $2400 depending upon where you choose to purchase it. All of the electronics are included in the package and the visual presentation of the guitar is no less than spectacular. 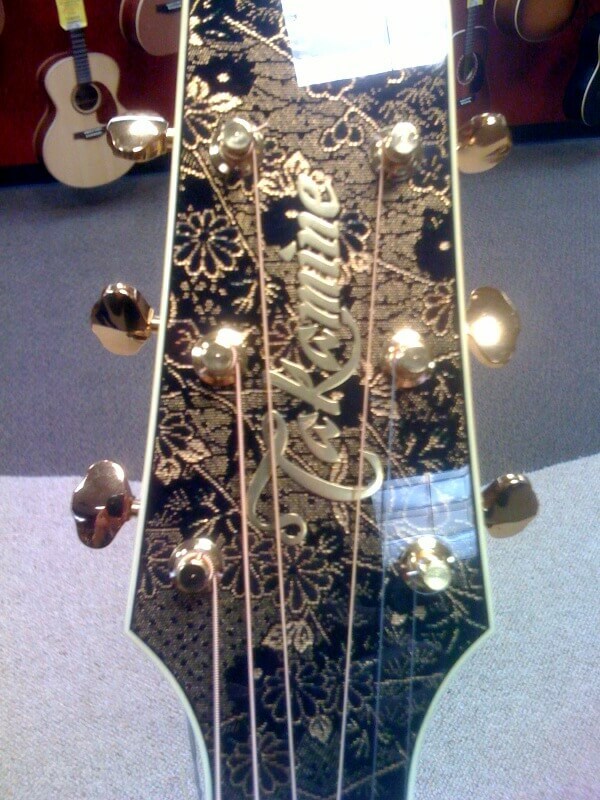 One word says it all when speaking of the Takamine LTD: wow! Played strictly as an acoustic instrument the guitar had a warm but booming resonance to it and was incredibly responsive. The fingerboard was smooth and virtually effortless to play while strumming, picking, or riffing. And then I plugged it in...the cool tube was like nothing I had ever experienced before! It added presence and power and sound that I can only compare to running the sound through effects costing tens of thousands of dollars. I added in the Piazzo pick-up and discovered even more range, depth and almost infinite variability that can be found with the blending control. This model is more expensive than many guitars on the market but considering the elaborate detail work on the guitar as well as the high tech electronics included, this is a fantastic buy. 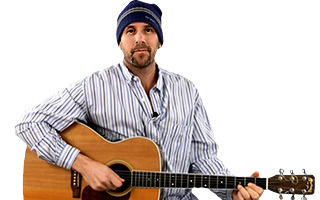 Learn more about our guitar lessons, live guitar courses, teaching tools & more. Master Courses, On-Demand, Live and more. JamPlay is the world's leader in online guitar lessons. Get an all-access pass and take courses from over 85 world class instructors. Chord Charts and voicings for over 900,000 chords. A huge resource!